Everything required to make heavy moves up to 60 tons is included in Hilman’s Deluxe Kits and Economy Sets! 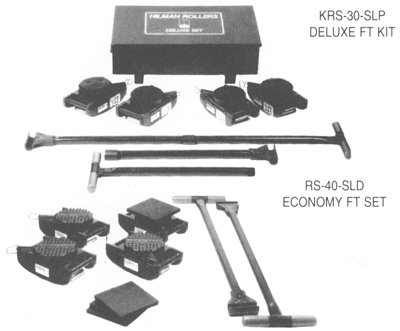 Both include four swivel locking Hilman Rollers with either padded or diamond steel tops and two steering handles; four preload pads are also included with rollers having the SLD style top. Sets contain full length steering handles; Kits contain knock down handles in two sections to fit into a sturdy steel storage case. Kit cases are lockable and have sturdy lifting grips for easy handling, providing protection from exposure and theft, while assuring all rollers are there when a heavy move needs to be made. Each kit or set provides the necessary gear to tackle a moving project up to that respective capacity. With seven capacities, three moving types (rigid, swivel, and swivel locking), and three top styles (padded, diamond steel, and smooth steel), there’s a model perfect for most heavy moving applications in this Hilman Roller series! For straight line moves, specify the rigid roller. For turns, swivel rollers position the load in tightest quarters. The swivel-locking type combines swivel and rigid designs with spring-loaded locks that can engage every 45 degrees. Steering handles are available for Swivel Lock and Swivel types in 3 lengths: H36F (36″ / 914mm) H48F (48″! 1219mm) HOOF (60″! 1524mm). 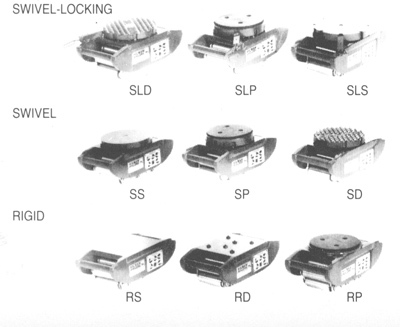 FT Series Hilman Rollers have three versatile top styles. “D” tops have steel spike-like grid able to grip into wood and provide a secure move for crated or palletized equipment. “P” tops, with built in neoprene pad, allow some compression and provide a non-slip surface, a versatile choice for moving on less than perfect floors or for moving metal based machines. “S” tops have smooth steel top, ideal for mounting the rollers to equipment or as a base unit for a variety of top modifications.